This post is part of WRI's blog series, Creating a Sustainable Food Future. The series explores strategies to sustainably feed more than 9 billion people by 2050. All pieces are based on research being conducted for the 2013-2014 World Resources Report. The world is projected to hold a whopping 9.6 billion people by 2050. Figuring out how to feed all these people—while also advancing rural development, reducing greenhouse gas emissions, and protecting valuable ecosystems—is one of the greatest challenges of our era. So what’s causing the global food challenge, and how can the world solve it? We begin to answer these questions through a series of graphics below. For more information, check out the interim findings of Creating a Sustainable Food Future, a report produced by WRI, U.N. Environment Programme, U.N. Development Programme, and the World Bank. The world’s population is projected to grow from about 7 billion in 2012 to 9.6 billion people in 2050. More than half of this growth will occur in sub-Saharan Africa, a region where one-quarter of the population is currently undernourished. 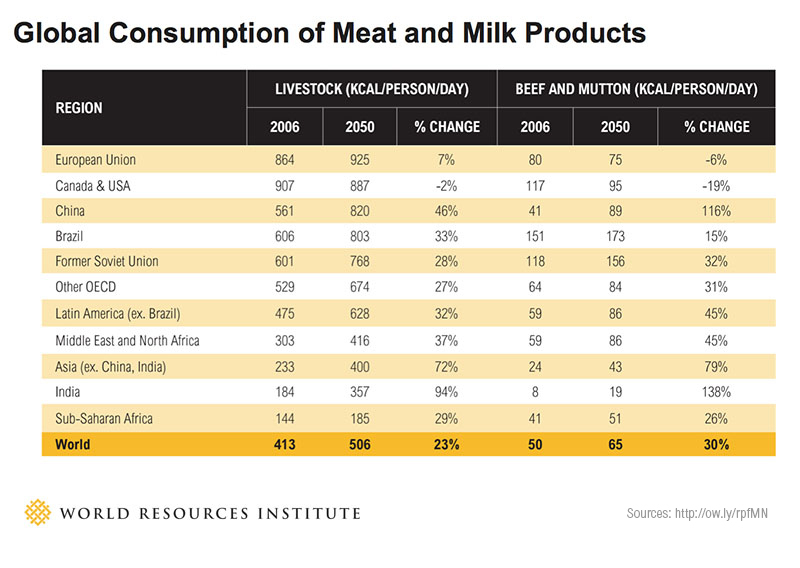 In addition to population growth, world’s per capita meat and milk consumption is also growing—especially in China and India—and is projected to remain high in the European Union, North America, Brazil, and Russia. These foods are more resource-intensive to produce than plant-based diets. Taking into account a growing population and shifting diets, the world will need to produce 69 percent more food calories in 2050 than we did in 2006. We can’t just redistribute food to close the food gap. Even if we took all the food produced in 2009 and distributed it evenly amongst the global population, the world will still need to produce 974 more calories per person per day by 2050. 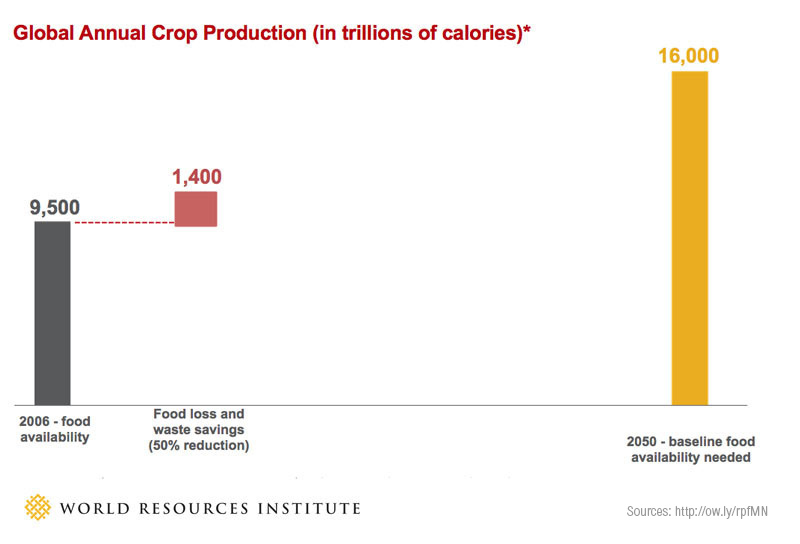 But we can’t just produce more food in the same way as today—we also must reduce food’s environmental impact. Agriculture contributes nearly one-quarter of global greenhouse gas emissions, uses 37 percent of landmass (excluding Antarctica), and accounts for 70 percent of all freshwater withdrawn from rivers, lakes, and aquifers. Climate change is expected to negatively impact crop yields, particularly in the hungriest parts of the world, such as sub-Saharan Africa. 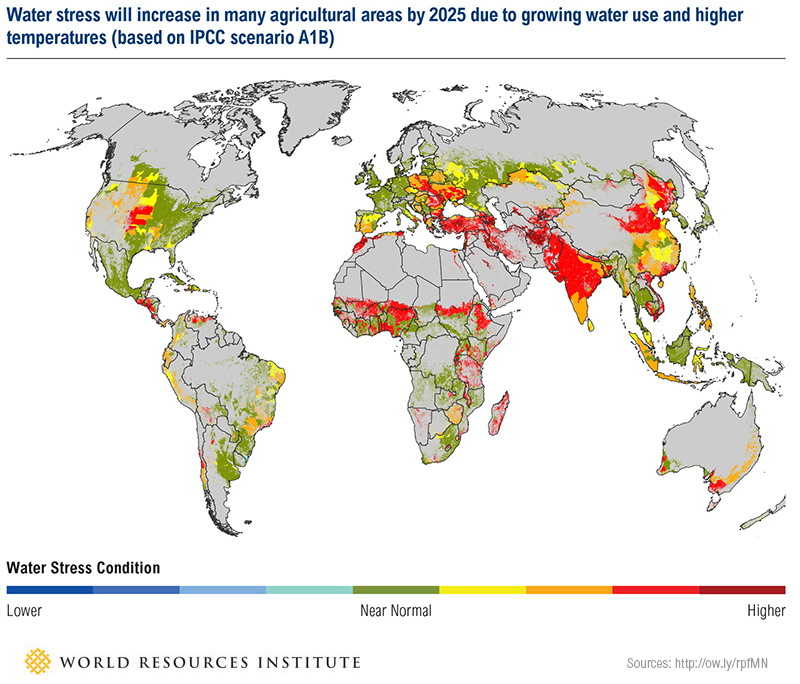 Growing water use and rising temperatures are expected to further increase water stress in many agricultural areas by 2025. Another major challenge is biofuels’ competition for land and crops. Producing 10 percent of all transport fuels from biofuels by 2050, as planned by some governments, would require 32 percent of global crop production but produce only 2 percent of global energy. It would also increase the food gap to roughly 100 percent. 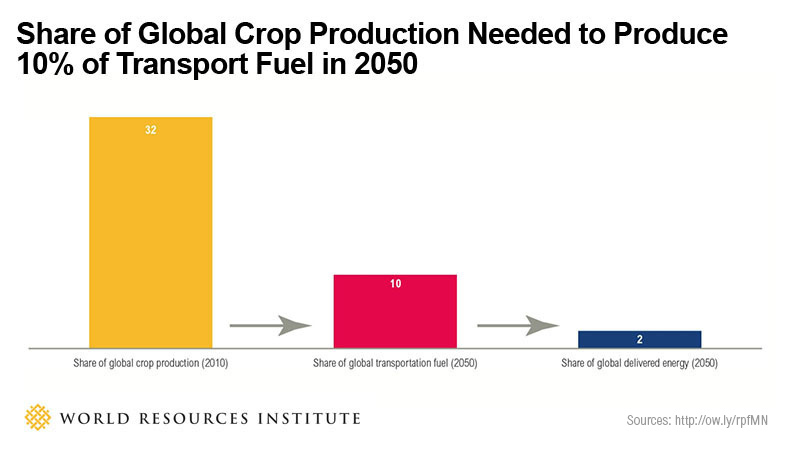 Conversely, eliminating the use of crop-based biofuels for transportation would close the food gap by roughly 14 percent. 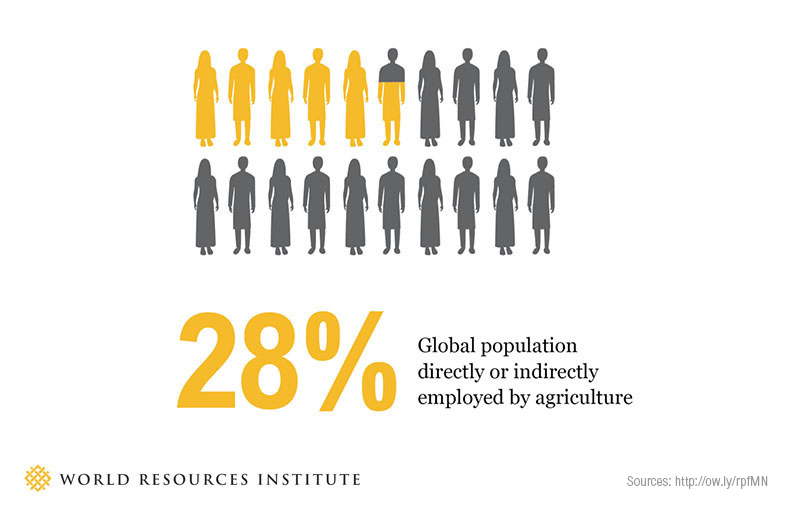 Around 2 billion people are currently employed in agriculture, many of them poor. We need to close the food gap in ways that enhance the livelihoods of farmers, especially the poorest. Achieving a sustainable food future, then, requires meeting three needs simultaneously: closing the food gap, supporting economic development, and reducing agriculture’s environmental impact. Roughly one-quarter of world’s food calories are lost or wasted between field and fork. Cutting this rate in half could close the food gap by about 20 percent by 2050. *Includes all crops intended for direct human consumption, animal feed, industrial uses, seeds, and biofuels. 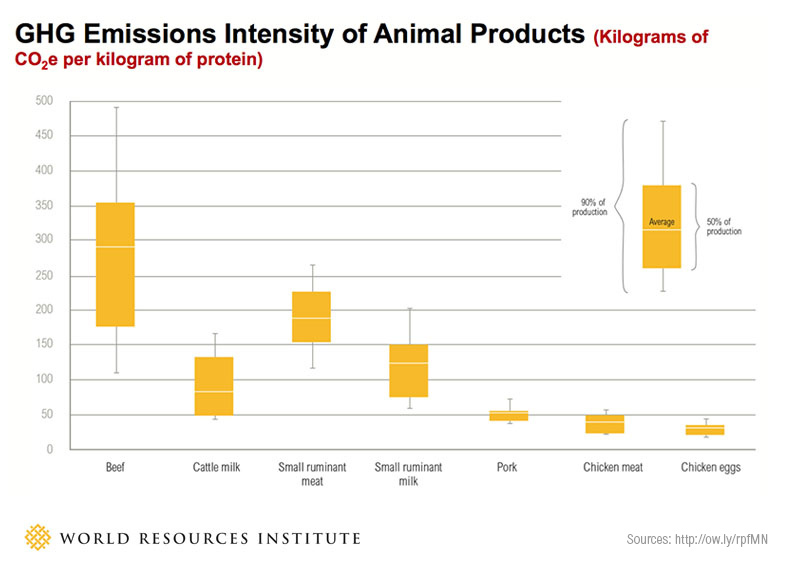 Beef is the least efficient source of calories and protein, generating six times more greenhouse gas emissions per unit of protein than pork, chicken, and egg production. Shifting just 20 percent of the anticipated future global consumption of beef to other meats, fish, or dairy could spare hundreds of millions of hectares of forest and savannah. 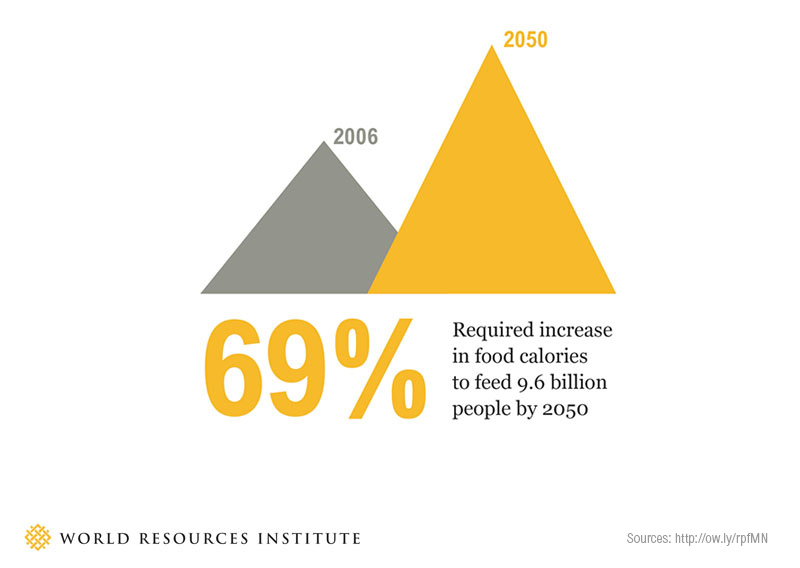 Reducing population growth can help hold down food demand. While most regions are projected to reach replacement level fertility—or the rate at which a population exactly replaces itself from one generation to the next—sub-Saharan Africa’s population is on course to more than double between now and 2050. Boosting yields is particularly important in sub-Saharan Africa, which currently has world’s lowest cereal yields but will account for one-third of all additional calories needed in 2050. Conservation agriculture—such as reduced tillage, crop rotations, and mulching—increased maize yields in Malawi. Combining these techniques with agroforestry—intercropping with trees—further increased yields. These practices could be scaled up on more than 300 million hectares in sub-Saharan Africa. Shifting agriculture land expansion to degraded lands can prevent deforestation, protect resources, and curb climate change. 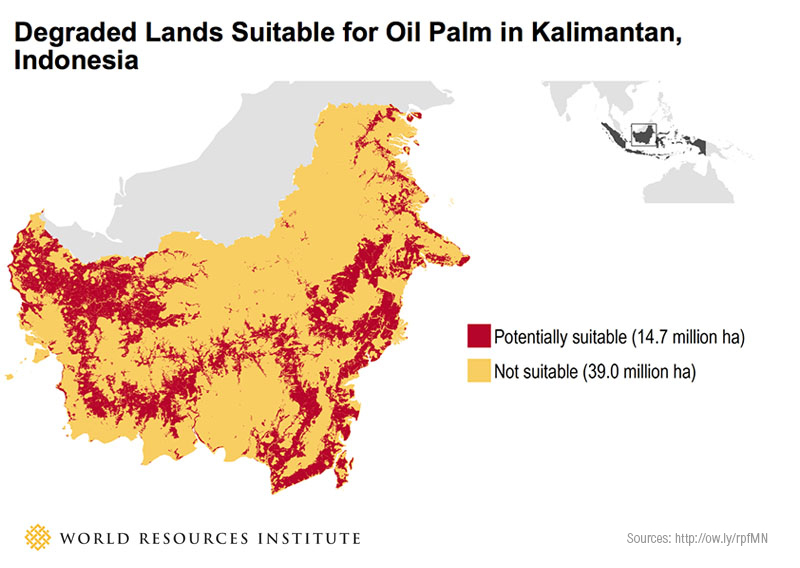 For example, more than 14 million hectares of low-carbon degraded lands in Kalimantan, Indonesia are potentially suitable for oil palm development. 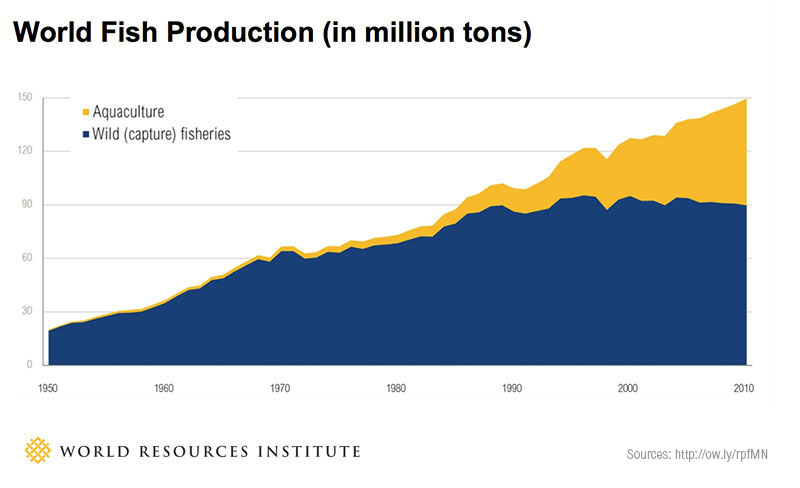 As wild fish catches have plateaued, aquaculture has expanded, producing nearly half of fish consumed in 2009. To grow in a sustainable way, aquaculture will need to produce more fish per unit of land and water and reduce its reliance on wild-caught fish for feed. No one solution can create a sustainable food future. A menu of consumption- and production-focused strategies, including those presented here, can close the food gap and generate environmental, health, and development co-benefits. But governments, business, and others need to act quickly and with conviction to scale these solutions up. Growing Population: United Nations Department of Economic and Social Affairs, Population Division (UNDESA). 2013. World Population Prospects: The 2012 Revision. New York: United Nations. Total population by major area, region, and country. Medium fertility scenario. Shifting Diets: Bunderson, W. T. 2012. “Faidherbia albida: the Malawi experience.” Lilongwe, Malawi: Total LandCare. 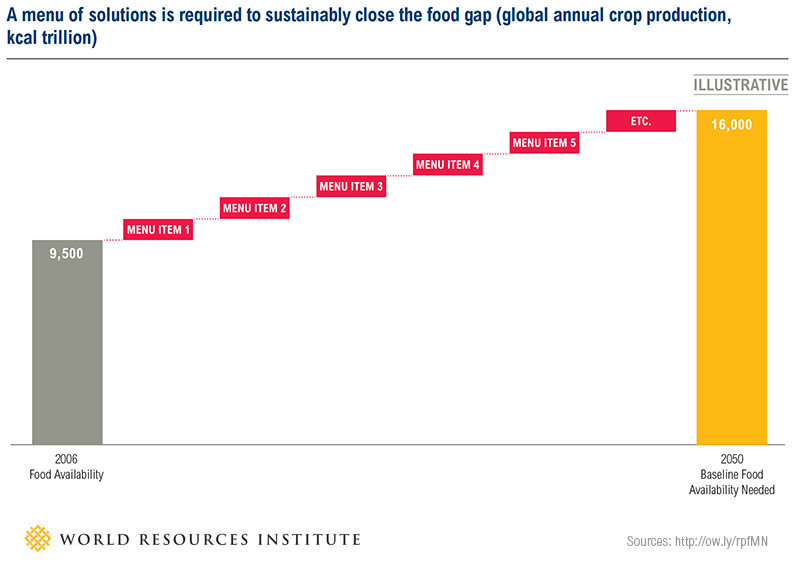 Food Gap: WRI analysis based on Alexandratos, N., and J. Bruinsma. 2012. 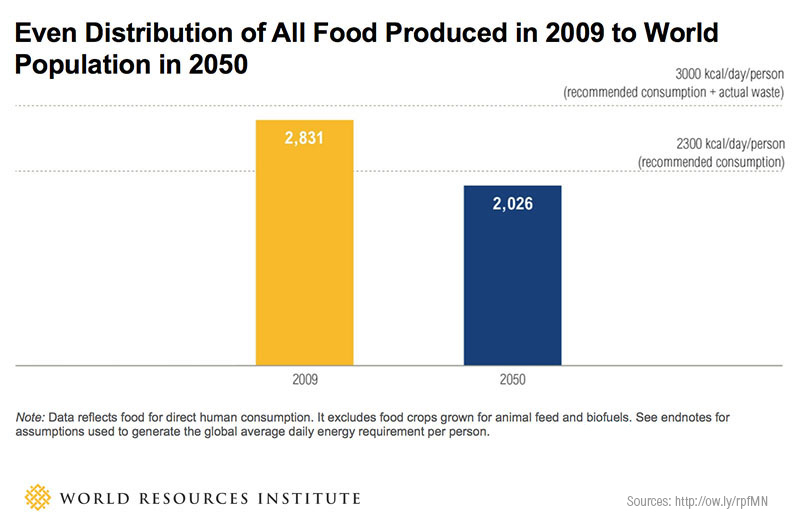 World agriculture towards 2030/2050: The 2012 revision. Rome: FAO. Food Distribution: WRI analysis based on FAO. 2012. “FAOSTAT.” Rome: FAO; United Nations, Department of Economic and Social Affairs, Population Division (UNDESA). 2013. 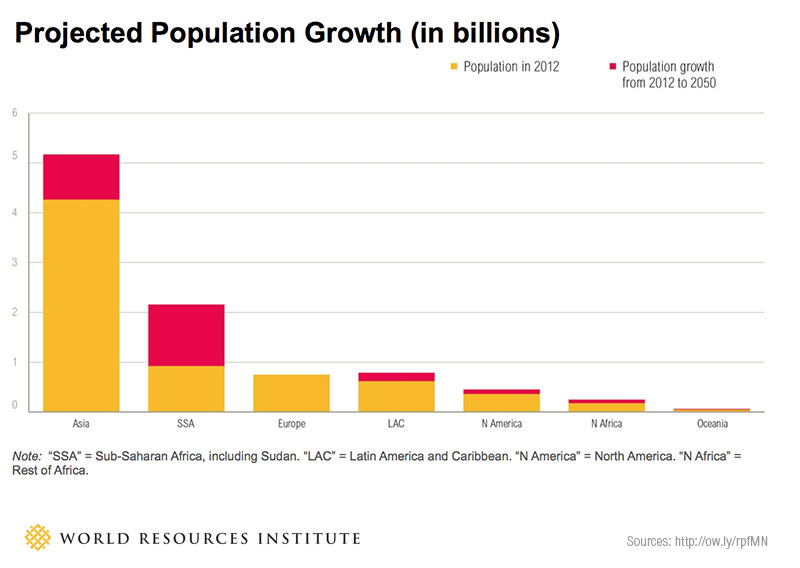 World Population Prospects: The 2012 Revision. New York: United Nations. Medium fertility scenario. Agriculture's Environmental Footprint: WRI analysis based on IEA (2012); EIA (2012); EPA (2012); Houghton (2008); FAO (2011); FAO (2012); Foley et al. (2005). 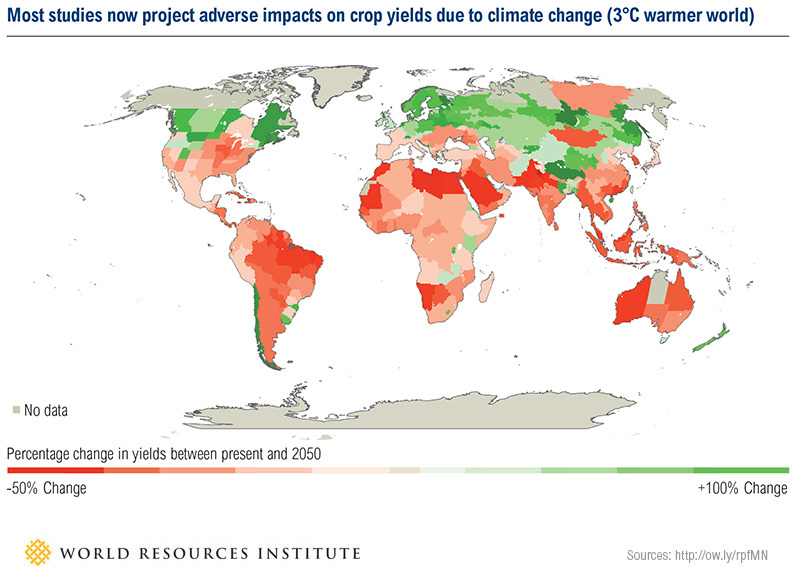 Climate Change and Crop Yields: World Bank. 2010. World Development Report 2010: Development and Climate Change. Washington, DC: World Bank. Growing Water Stress: World Resources Institute and The Coca-Cola Company. 2011. “Aqueduct Water Risk Atlas Global Maps 1.0.” Accessible at . Cropped areas from Ramankutty, N., A. T. Evan, C. Monfreda, and J. A. Foley. 2008. “Farming the planet: 1. Geographic distribution of global agricultural lands in the year 2000.” Glob. Biogeochem. Cycles 22: GB1003, doi:1010.1029/2007GB002952. Energy-Food Nexus: Heimlich, R. and T. Searchinger. Forthcoming. Calculating Crop Demands for Liquid Biofuels. Washington, DC: World Resources Institute. Food and Development: World Bank. 2012. World Development Indicators. Accessible at: https://databank.worldbank.org/Data/Home.aspx (accessed December 13, 2012). Annual Crop Production: WRI analysis based on Bruinsma, J. 2009. 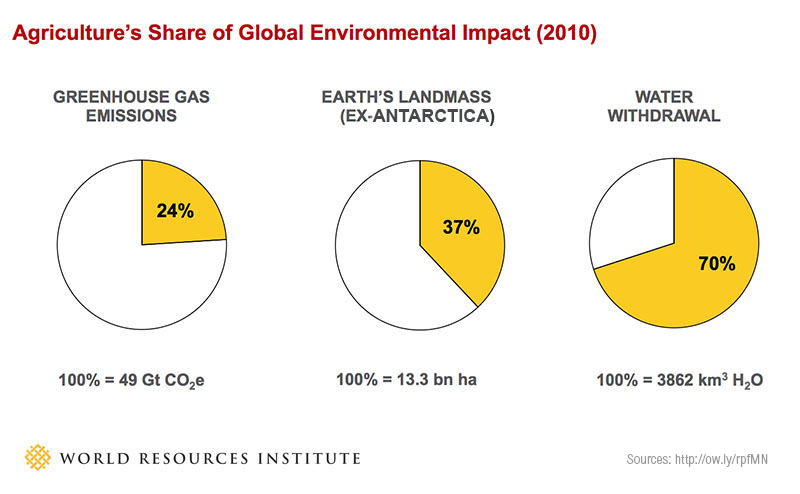 The Resource Outlook to 2050: By how much do land, water and crop yields need to increase by 2050? Rome: FAO; Alexandratos, N., and J. Bruinsma. 2012. World agriculture towards 2030/2050: The 2012 revision. Rome: FAO. GHG Emissions from Animal Products: GLEAM in Gerber, P. J., H. Steinfeld, B. Henderson, A. Mottet, C. Opio, J. Dijkman, A. Falcucci, and G. Tempio. 2013. Tackling climate change through livestock: A global assessment of emissions and mitigation opportunities. Rome: FAO. Current and Projected Fertility Rates: United Nations Department of Economic and Social Affairs, Population Division (UNDESA). 2013. World Population Prospects: The 2012 Revision. New York: United Nations. 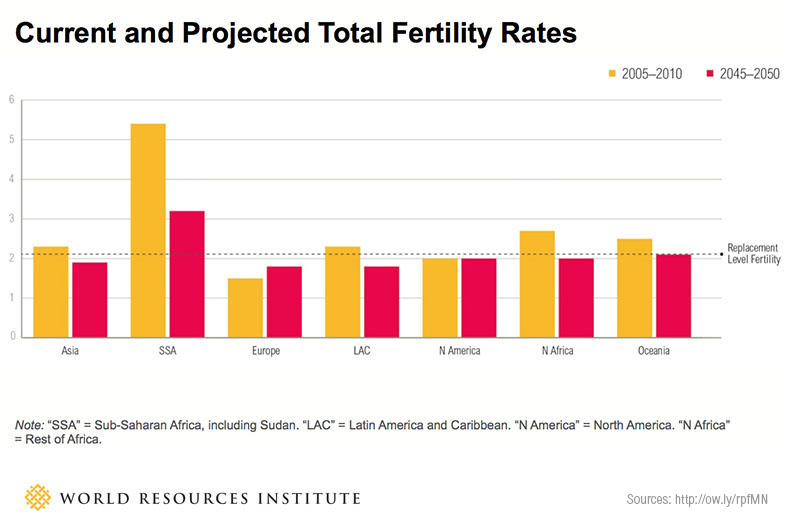 Total fertility by major area, region, and country. Medium fertility scenario. 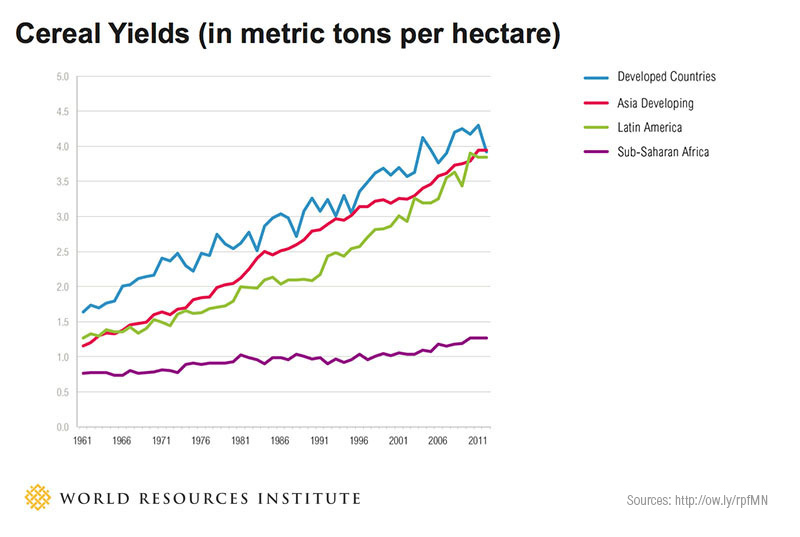 Cereal Yields: Derived from FAO. 2012. “FAOSTAT.” Rome: FAO; graph by IFDC. Maize Yields in Malawi: Bunderson, W. T. 2012. “Faidherbia albida: the Malawi experience.” Lilongwe, Malawi: Total LandCare. Degraded Lands in Kalimantan: Gingold, B. et al. 2012. How to Identify Degraded Land for Sustainable Palm Oil in Indonesia. Washington, DC: World Resources Institute. World Fish Production: FAO. 2012. “FishStatJ.” Rome: FAO. Closing the Food Gap: WRI analysis based on Alexandratos, N., and J. Bruinsma. 2012. World agriculture towards 2030/2050: The 2012 revision. Rome: FAO.